Immersed in the current craze of the recent premier of the Star Wars saga latest film (December 10th in Los Angeles! ), we take a closer look at one of the set´s magic locations: Malin Head. Found in the beautiful northern Irish county of Donegal, this is indeed one of the World class places to spot the true, ultimate Jedi: the second largest fish in the World, the basking shark, and the peregrine falcon. Much like its bigger brother the whale shark (living in another galaxy, far, far away), the basking shark is not driven by the dark side of the force - as the word shark sadly and mistakenly suggests to many as yet. Instead, it is a filter feeder, being able to filter over 2000 tons of water per hour in search for krill, fish eggs and plankton. Adults reach a size of 20 to 26 feet (6 to 8 meters, although able to reach 10m in some cases) and it is a slow moving creature that reduces its speed considerably while filtering. Unlike its neighbour: the falcon. Ever wondered why the spaceship manned by Han Solo was named the Millenium Falcon? Wonder no more: the peregrine falcon is the fastest animal on Earth. Able to exceed 200 mph (322km/h) while diving, this bird is a natural missile. 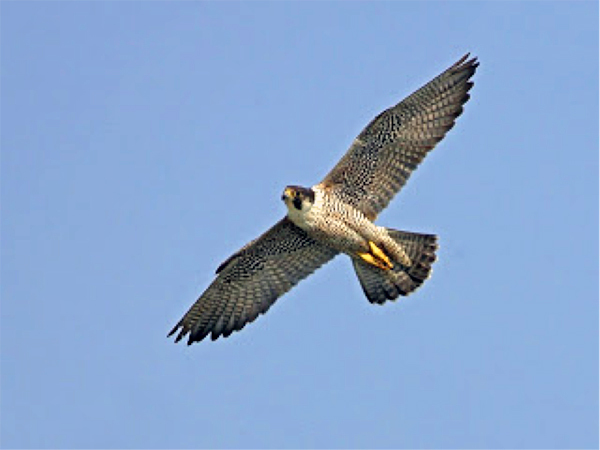 The peregrine falcon is an all-year-round, northernly inhabitant of Ireland and it shares the Malin Head bird natural haven with other species, such as the eider duck, the buzzard, the barnacle goose and the rare corn crake. Much like a bird tavern somewhere in Tatooine, minus the jazz. However, it is the basking shark and the peregrine falcon that awakens the strongest interest of visitors in the area. The basking shark has nowadays the status of vulnerable species according to our friends at IUCN (the International Union for Conservation of Nature). Thanks to some great basking shark preservation programs we can still enjoy its magnificence. On the other hand, we hear that the police of Northern Ireland is using drones as off May 2017 to watch over the safety of the falcons and some other prey birds, due to recent killing (either by poisoning or other ways) of these animals. Hence the basking shark and the peregrine falcon are the true last Jedi, at least around Malin Head. May the force be with them…and may you too!